A mineral thought to be unique to the Moon has been discovered in the Pilbara region. Tranquillityite was first discovered when lunar rocks were brought back to Earth by US astronauts Neil Armstrong, Edwin Aldrin and Michael Collins. 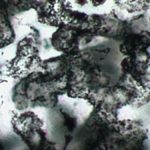 It was one of three minerals believed to be unique to the moon; the others, armacolite (named after Armstrong, Aldrin and Collins) and pyroxferroite, have since been discovered on Earth. Scientists from the University of Western Australia (UWA) and Curtin University have shown for the first time that tranquilltyite also occurs on Earth, in a study published in Geology. ” I suspect that if we had found a completely new mineral it would not have attracted as much attention, but there is a certain mystique attached to the Moon,” UWA scientist Janet Muhling said. The mineral was discovered in Pilbara rocks that had been collected to determine whether they contained minerals that could be used for geochronology, such as zircon, baddeleyite and zirconolite. “Lunar basalts also contain these minerals, as well as tranquillityite, so although we had looked at many dolerites without finding tranquillityite we had an eye out, just in case,” Muhling said. To confirm the identity of the mineral, the scientists needed to work out its elemental composition. The samples were hit with a beam of electrons from an electron probe microanalyser, causing them to emit X-rays and identifying the elements present. Another indicator was its crystal structure, which was examined in a transmission electron microscope. When the electrons pass through the sample they are diffracted by planes of atoms, allowing the symmetry of the crystal to be resolved. The discovery shows that the crystallisation of some terrestrial dolerites followed a similar path to lunar basalts, but the scientists’ main interest in tranquillityite is that it is a very good mineral for dating the enclosing rock. Previous geological mapping suggested that the Pilbara dolerites were 820 million years old, but the tranquillityite has been dated at 1040 million years. “Precise geochronology is essential for working out the history of rocks on Earth, and new dates can cause major re-thinks in the geology of a region,” Muhling said. The tranquilllityite from the Sea of Tranquillity basalts has been dated at 3710 million years, confirming earlier estimates of the age of the basalts. This is believed to have been a period when the Moon and the Earth were bombarded by meteorites; however the evidence for this on Earth has since been destroyed. Tranquillityite is found in basalts on the Moon, but has been discovered in dolerites on Earth. Image: Janet Muhling. The Moon was first visited in 1959 by the Soviet spacecraft Luna. The Moon’s crust averages 68 kilometres thick, ranging from 0 under Mare Crisium to 107km north of the Korolev crater. The interior of the Moon is no longer active.